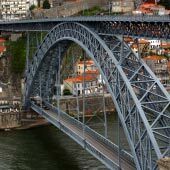 Porto is a charismatic city that offers historic monuments, outstanding tourist activities and an endless abundance of Portuguese charm. The historic centre is relatively compact, and the main sights can be squeezed into a single (long!) day of sightseeing. 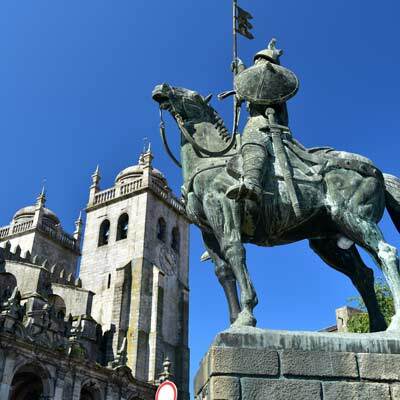 Generally, we recommend two days to fully discover Porto, but this walking tour is ideal if you are constraint by time, either as a cruise ship passenger or have a long flight connection. 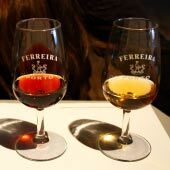 The tour will cover the main sights of Porto and is the perfect introduction to the city. 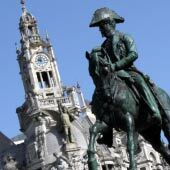 The walking tour starts from the Praça da Liberdade (GPS: 41.14622, -8.61143), which is in central Porto. 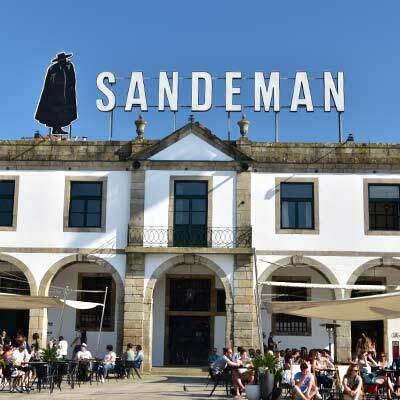 If you are traveling from the airport, catch the metro from the airport to the Trindade metro station (zone 4 ticket - €2.00, 27min journey) and the exit the station and walk south along the Avenida dos Aliados. A second metro could be taken from Trindade station to Aliados or São Bento, but it is only 500m to the start location of the tour. Cruise ships to Porto more at the Terminal de Cruzeiros do Porto de Leixões (GPS: 41.17739, -8.69984) in the town of Matosinhos. 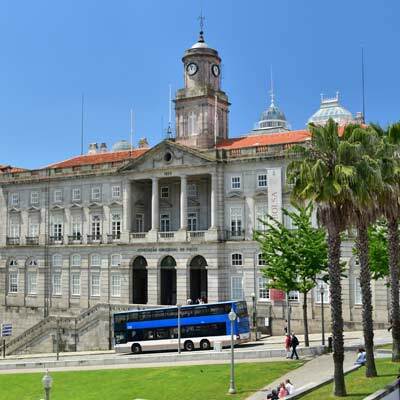 The 500 bus route provides a direct and regular bus service between Matosinhos to the Praça da Liberdade in Porto. The nearest bus stop to the terminal is Godinho (GPS: 41.18161, -8.69215), a single fare is €1.60 and the journey takes 40 minutes. 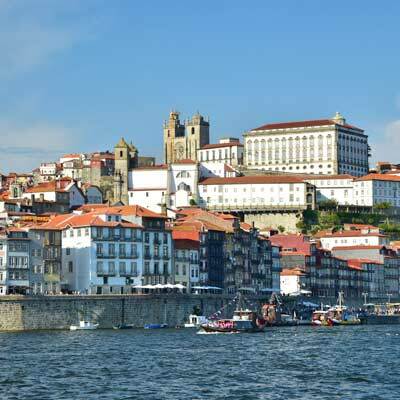 This is a very scenic rout as it follows the Douro River. 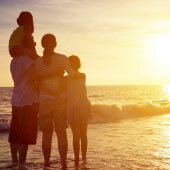 Warning: Always allow sufficient time to travel back to the airport or cruise terminal. 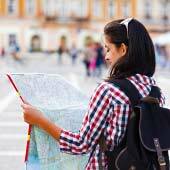 Below is the suggested 1-day walking route, as shown on google maps. 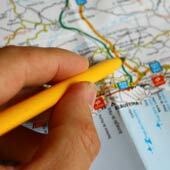 This section details the walking tour and provides images of the main tourist sights. 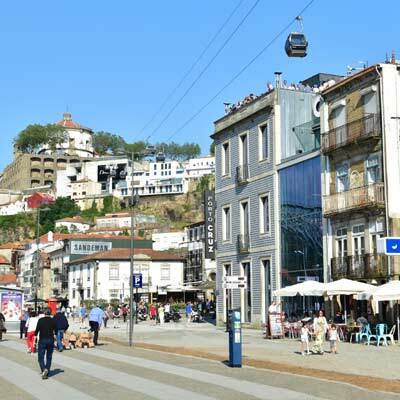 The Praça da Liberdade is the main plaza of Porto, and is the perfect location to start a tour of Porto. 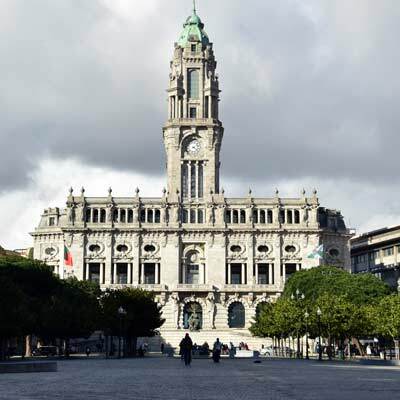 The imposing 1920s architecture, constructed in sombre granite, reflect the importance of Porto’s financial and commercial sector to the city. At the top of the Praça da Liberdade - is the Câmara Municipal (City Hall), with its distinctive clock tower. Random attraction: The McDonald's on the Praça da Liberdade is considered as the most beautiful McDonald's in the world. It was originally the grand Cafe Imperial and the conversion to McDonald’s retained all of the art deco features, including stain glass mirrors and extravagant chandeliers. To the west of the Praça da Liberdade is the Igreja dos Clérigos (GPS: 41.14574, -8.61448). This church has a unique oval designed by the celebrated Italian architect Nicolau Nasoni, but most visitors are drawn by the adjacent Torre dos Clérigos (Clergymens Tower). 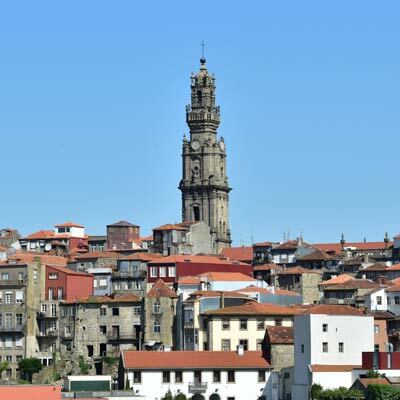 The tower is the highest structure in the historic centre of Porto, and those who climb the demanding 240 steps are rewarded with some of the finest views of Porto. Further along the road is the tree lined Jardim da Cordoaria park and the Antiga Cadeia da Relação (GPS: 41.14468, -8.61575), Porto’s original prison. Today the prison complex houses the Fotografia Museum and is free to visit. 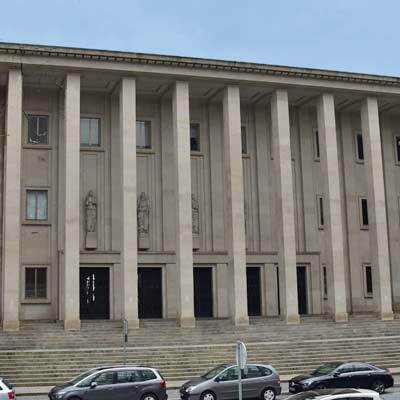 On the far side of the Jardim da Cordoaria is the imposing Tribunal da Relação do Porto (Court of Appeal, GPS: 41.14545, -8.61765) and the expansive but sombre Santo António Hospital. The Antiga Cadeia da Relação, and a giant sign that is always popular for Instagram photos! 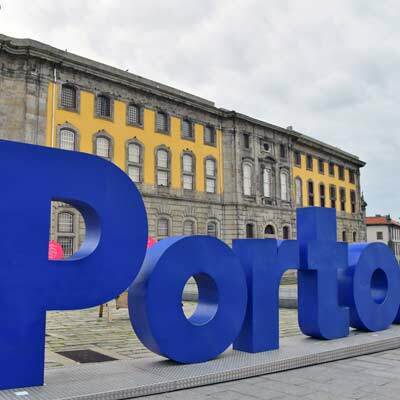 On the northern side of the park is the main University of Porto campus and this is close to the main nightlife hub of Porto, centred around the Praça de Parada Leitão and the Rua Galeria de Paris (affectionally, known as bar street!). 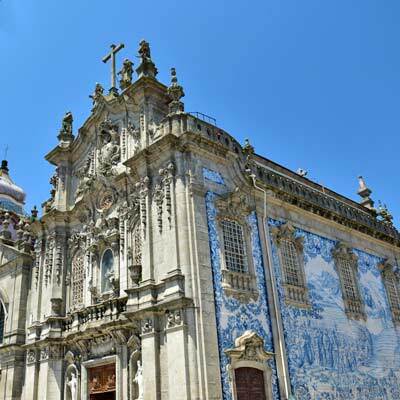 Opposite the university complex are the combined churches of Igreja do Carmo, and Igreja dos Carmelitas (GPS: 41.14731, -8.61674). 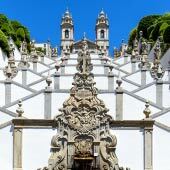 These churches are much photographed, as the eastern wall is adorned with beautiful tile paintings. 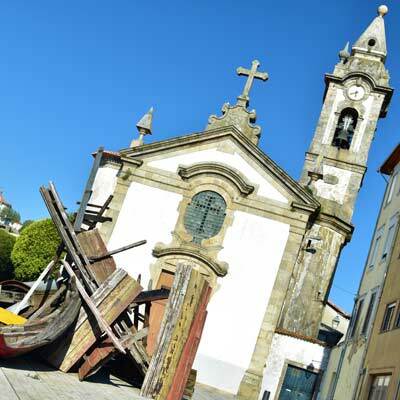 A quirky ancient law prevented two churches sharing the same wall so separating the churches is Portugal’s narrowest house (now a museum leading to the Igreja do Carmo). 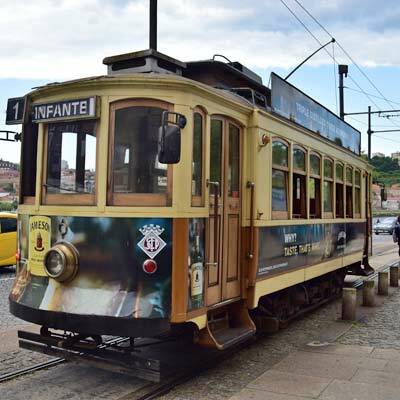 Departing from the Praça de Parada Leitão is the number 22 tram, which provides a scenic loop of central Porto. 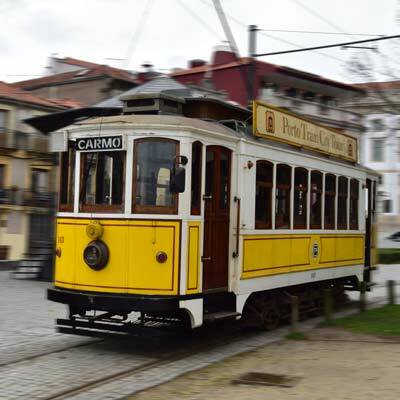 This tram route (45min €3) is a great way to see the city, but it can be very popular and difficult to get a seat. 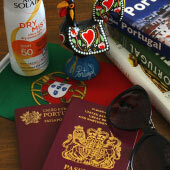 Heading back on the northern side of the Praca De Lisboa is the Livraria Lello bookshop, (GPS: 41.14684, -8.61481). If you are a fan of Harry Potter this should not be missed, as it was the inspiration for Hogwarts grand staircase, and where JK Rowling wrote the initial chapters of the series. 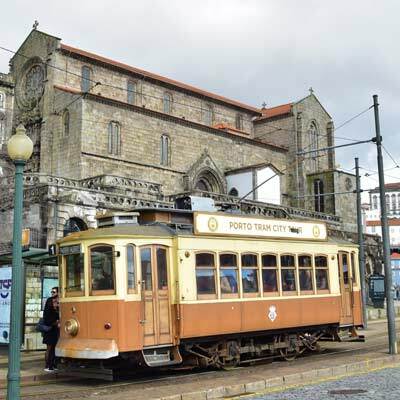 Walking downhill past the Igreja dos Clérigos leads to the São Bento train station (GPS: 41.14547, -8.61048). 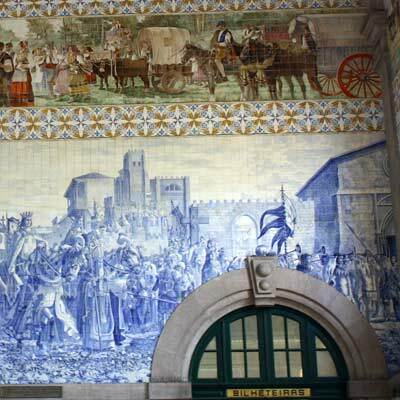 The main concourse has some of the finest Azulejo tiles in Porto, and the two styles (blue and coloured) reflect the transition from a monarchy to a republic that occurred during its construction, in 1910. 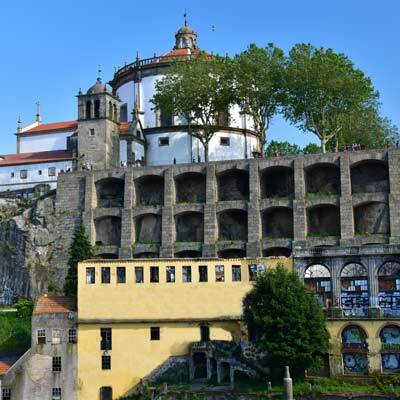 Uphill from the station is the Se Cathedral (GPS: 41.14281, -8.61139), the ancient and heavily fortified religious centre of Porto. 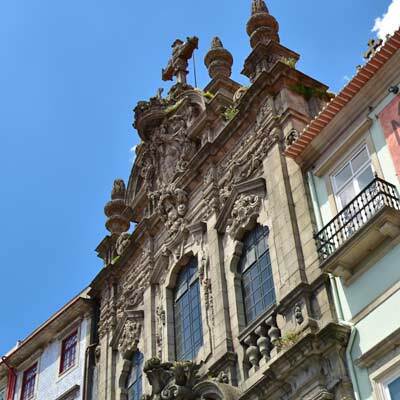 The Gothic cloisters, Romanesque origins and Baroque exterior may excite historians, but for most visitors, it appears stark and bleak, especially when compared to the extravagance of other churches in Porto. The pedestrianised Avenida Vimara Peres leads from the rear of the Se cathedral to the upper deck of the Luís I Bridge (GPS: 41.14136, -8.60981). 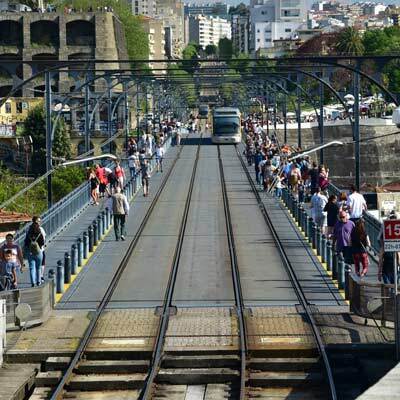 From the vantage point on the bridge are wonderful views over the city and upriver, just be careful with the metro which crosses the same level! ! Se Cathedral and the Vímara Peres Statue – do note the incorrect years of his life…. 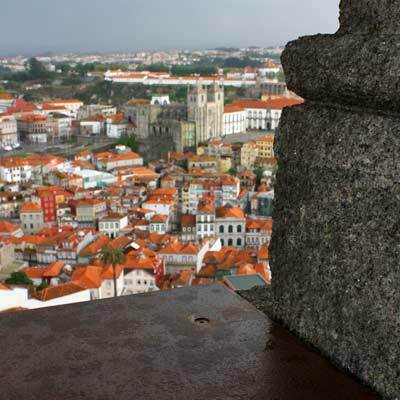 The Mosteiro da Serra do Pilar (GPS: 41.13821, -8.60814) is at the top of the cliffs on the southern side of the Douro River and is the finest viewpoint in Porto, but it is yet another uphill walk. 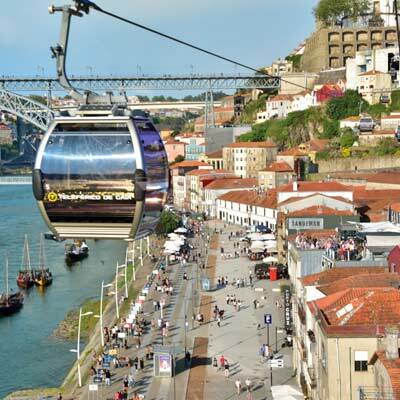 The Jardim do Morro (GPS: 41.13767, -8.60933) is a popular park for Porto’s residents to hang out during the summer and is the location for the cable car down to the waterfront. One of the finest examples of urban art in Porto is the “Half-Rabbit” (GPS: 41.13693, -8.614981). 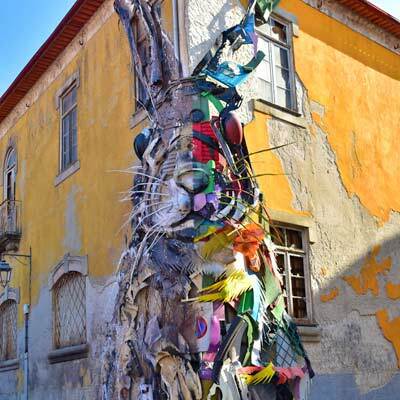 This distinctive piece of art has been constructed purely from discarded rubbish and is hidden down a side street close to the Igreja Santa Marinha. The Half Rabbit sculpture made out of rubbish, amazing! 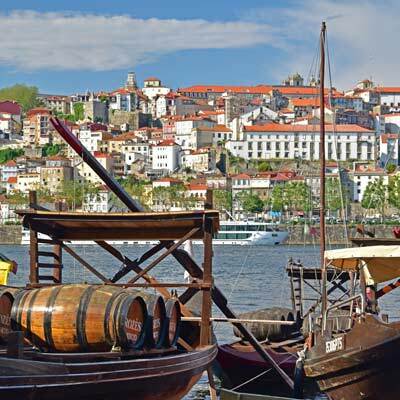 At the far end of the Vila Nova de Gaia promenade is the Estaleiro do Rabelo Shipyard (GPS: 41.13783, -8.62007). 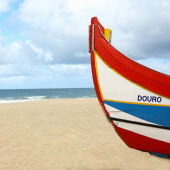 Here traditional Rabelo obats are repaired and built using classical methods. 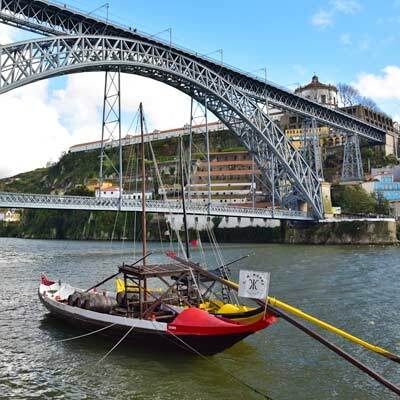 Return back to Porto by crossing the lower level of the Luís I Bridge (GPS: 41.14068, -8.60997). 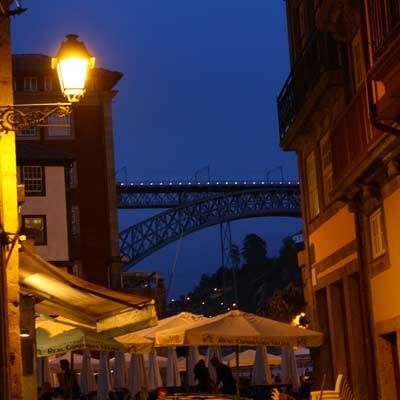 This leads into the Ribeira district. 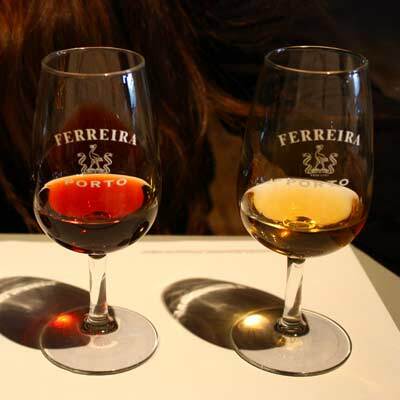 The Misericórdia (the Mercy) were an early Portuguese charity in which Portugal’s nobles donated money to fund hospitals throughout the country. 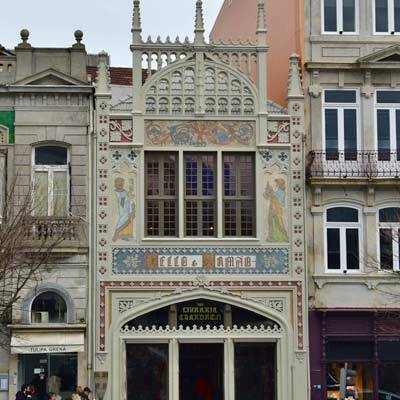 The Museu da Misericórdia do Porto GPS: 41.14356, -8.614423) on the Rua das Flores, exhibits portraits of the donors, details their work and provides entrance to the lavish Igreja da Misericórdia. 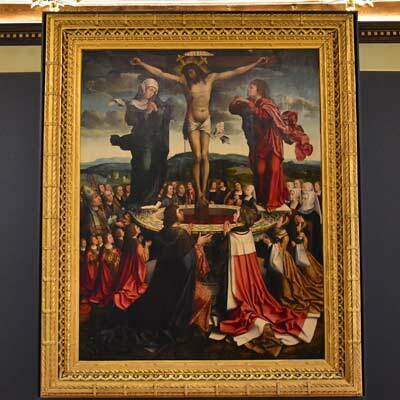 The standout exhibit is the Fons Vitae painting, one of the finest gothic paintings in Portugal. 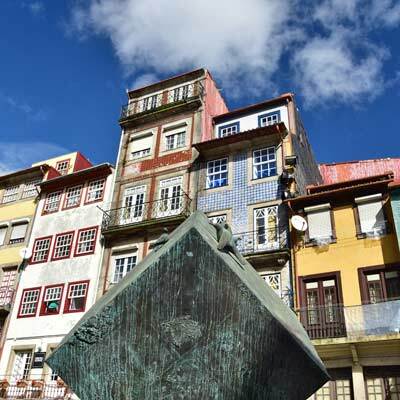 The Rua das Flores (GPS: 41.14320, -8.61468) is one of Porto’s best shopping streets and is filled with independent store, quirky tourist stalls and family run cafes. 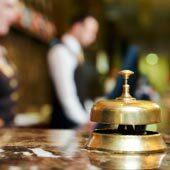 The uphill walk leads to the São Bento train station, which is close to the Praça da Liberdade and method to head back to your cruise ship, the airport or hotel.